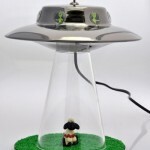 There are few things cooler or more awesome than seeing a cow being lifted into a flying saucer. Though the cow may disagree. 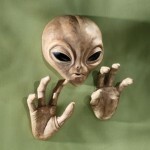 Haven’t witnessed this with your own eyes in the night sky? Here’s the next best thing. The antenna on top is the on/off switch. 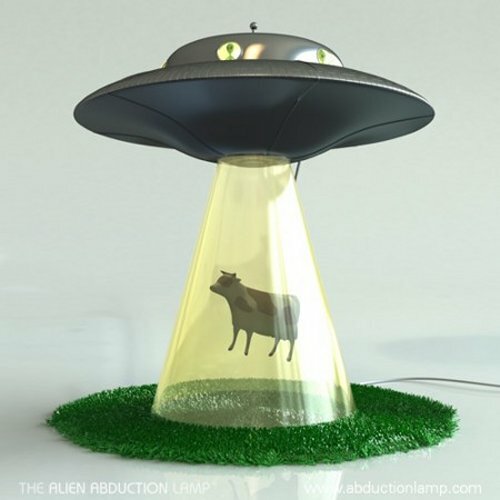 It comes in a plain version with just the saucer and light ray and you can also get the more humorous cow abducting edition. 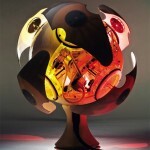 The Alien Abduction Lamp is in the functional prototype stage and not yet available, sadly. Hopefully soon as I know the creator has been at it for some time. We want one or three. It must be a government conspiracy that it hasn’t been released yet.